I am very lucky to live in an area where there is a really nice residents society which creates a lovely community feel amongst the residents. Every one in the neighbor hood always pitches in be it for a pot luck part, street lunch, a church jumble sale or helping at local community hall. These events are all run by volunteers and the funds to provide for them are also raised by the residents too.The money is raised through quarterly resident magazine, memberships, sponsor ships from local businesses, jumble sales and bring and buy sales too. Of course we mustn't forget the Christmas and the summer fetes too. A lot of the residents in the area are elderly and some are often craving for some company and a meet up. Loneliness is something that a lot of elderly people face and because of this Sunrise Senior Living, the UK care home provider have created a campaign to reduce loneliness amongst the elderly and encourage community participation like ours to combat this. The lunches are all provided by the residents and cooked by volunteers. One Friday every month, I go in to help cook the lunch.The lunches are always three course starting with soup, a main meal an a dessert.The soup that I really like to cook is Butternut squash and lentil. Its hearty and delicious and easy to make too. Below you can see the recipe. 1. In a pan add the 200 ml of stock and add the lentils ,cook for 20 minutes and once cooked keep aside. Don't overcook the lentils they should hold shape.2. In a separate pan add the oil and saute the onions for 2-3 minutes, Take out a tablespoonful of cooked onions and keep for garnish and to the remaining onions add the carrots and butternut squash and saute for 3-4 minutes. 3. Add the 200 ml vegetable stock and simmer the soup for 15 minutes until the vegetables are cooked.4. Blend the cooked vegetables in a blender and transfer the soup to the pan with the cooked lentils. With a spoon mix together the vegetables and the lentils. 5 Season with salt and pepper.6. 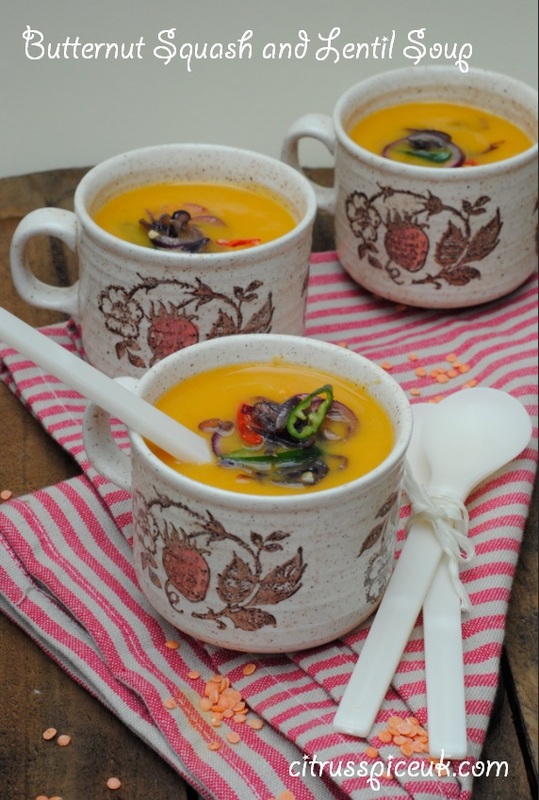 Serve the soup in mugs and garnish with the fried onions and sliced chilli. 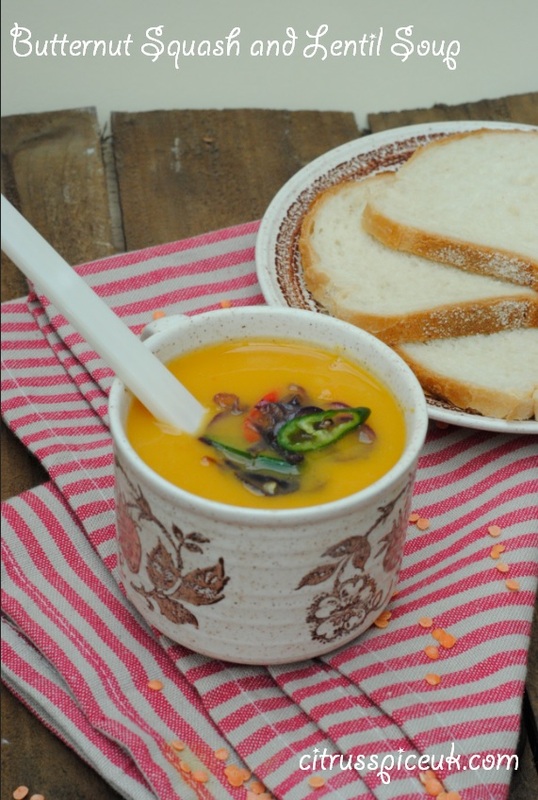 Serve the soup with fresh crusty bread. Nice soup for the kind of weather we have here right now. Actually hubby doesn't like squash and carrots .. but maybe the addition of lentils is a good idea .. I'll try it and see oif he likes it. I love the sound of your Friday lunch, such a wonderful idea to bring people together for some yummy food and company. I'm not a big fan of soups to be honest, never really have been, don't know why. But what your community does for the elderly sounds lovely, as I know lots of elderly people in my area that would benefit from a similar thing! They look absolutely delicious. I have a butternut squash laying around! Perfect will try! I love butternut squash and your soup sounds delicious! What a lovely area you live in too- you must bring a lot of happiness to the elderly with that initiative. I'd love to try this soup! Butternut is hard to get here, I think. Btw, are you sure those cooking times are right? This is such a hearty and healthy soup.. I never used to like soups much, but now I am loving them.. Like the addition of lentils..
Lentil and anything does it for me Nayna and this looks delicious. Love the garnish and the fact you help out at this very important community event. 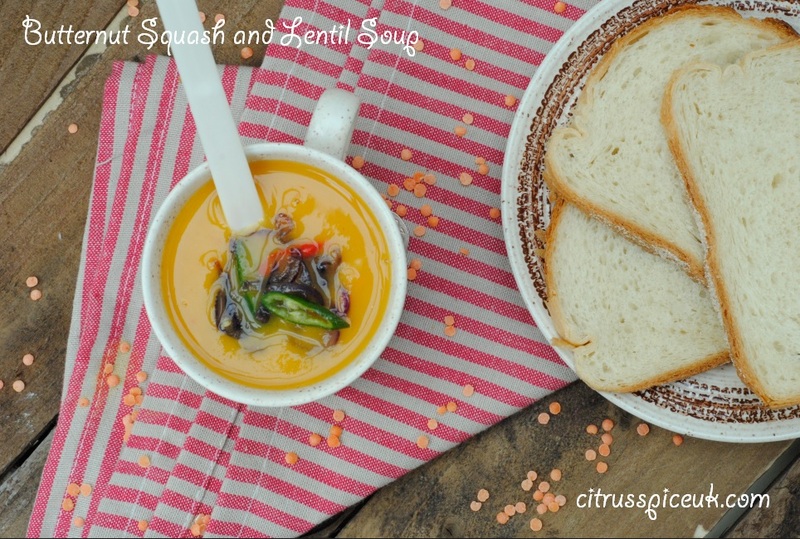 I love squash and lentil soup (often with the addition of sweet potato) and I'm sure the people you're feeding love it too. Great to hear you are helping out. I bet they all really appreciate it. Loving the retro soup cups/bowls! I think this sounds like something my kids would enjoy too they lI've soup. Your residents' group sounds great - the people in your community who live alone must be especially pleased to be a part of it. Thank you for sharing your recipe, it sounds very tasty. What a lovely thing to do Nayna, and I bet this soup goes down a treat. what a wholesome lovely recipe ..
That looks great. Nice of you to share. Thank you so much for sharing this, I love butternut squash! We had some recently for the first time in a little while and I'd forgotten how delicious it is. Definitely must try this! Looks delicious. Great for the winter months to keep warm! That soup looks amazing, I'm going to have to give this a go, thanks for the recipe.